I had arrived in Saigon, or as they now call it, Ho Chi Minh City, on my tour of Cambodia and Vietnam. This was a dream trip for me. Growing up in the 60’s in North America, something was always happening in this period of rapid change. I was in High School when John. F Kennedy was shot in Dallas in 1963 and Lyndon Johnson was elected president of the United States in 1964. I was aware there was a war going on in Vietnam, but is seemed so far away, I didn’t give it much thought until the “Draft Dodgers” started arriving in Canada. I was in University at the time and realized that many of my profs and fellow students were newly arrived young American males. Not everyone was a draft dodger, some had obtained deferments or exemptions. There had been some opposition to the draft in the USA prior to their involvement in Vietnam, but it was when the Baby Boomers, that well known group ( me included) born between 1946 and 1964, became eligible for the draft, that there was a steep increase in these deferments and exemptions, especially for college and graduate students. For those that were not successful…..living in Canada was a possibility. where all I wanted was a room where I could hole up in the cool. It was waiting for me and I didn’t care if I ever left. Well as you will know if you travel, this feeling passes quickly once you are revived with a local beer and a short rest. Thank goodness for Mini Bars, even if they cost a fortune! I was ready to take on SAIGON! I discovered that our tour the next day would be to the Cu Chi Tunnels somewhere outside of Saigon and that it would take most of the day. Now I had never heard of the Cu Chi Tunnels and didn’t have a clue as to where I was going or what I would be seeing. I did a bit of research on my laptop and discovered that these tunnels, 40 km north of Saigon near the village of Cu Chi and covering some 400 square km, had originally been dug in the 1940’s when the Communist led Viet Minh were fighting French Colonialism. When the Vietnam War, or as the Vietnamese refer to it…the American War, began in the 60’s, the Viet Cong dug more tunnels and linked them together from one village to another. This area, a Viet Kong stronghold, was heavily defended and used as a base for attacks on Saigon. When the Americans built their base at Cu Chi in 1966, they were unaware that just below them were hundreds of miles of tunnels that reached as far as Saigon. It is impressive to note that these tunnels were dug by hand…..they used a simple tool and a basket to take out the dirt! The 75 mile long complex of tunnels at Cu Chi has been preserved by the government of Vietnam and turned into a destination for tourists, as well as a memorial park with two different tunnel display sites, Ben Dinh and Ben Duoc. Visitors are told about the tunnels with demonstrations by interpreters and invited to crawl around in the safer parts of the tunnel system. These have been modified to allow larger people entry. The tunnels contained living areas, storage depots, ordnance factories, hospitals, headquarters and a range of facilities than enabled people to live, and wage war from underground for years at a time. When United States and Australian troops began sweeps into the area they had no idea of the tunnels’ existence. Known as Operation Crimp (1966) and involving some 8,000 troops from the United States and Australia, this attempt to defeat the Viet Cong in the Cu Chi district was, to that date, the largest operation in Vietnam. Cameramen and Reporters in Saigon, was that the greatest power on earth had been humbled by the courage of the Vietnamese resistance. U.S. public support for the war declined and the U.S. sought negotiations to end the war. Nixon was elected president in November 1968 with his plan to end the war in Vietnam. It took him 5 years to do so. 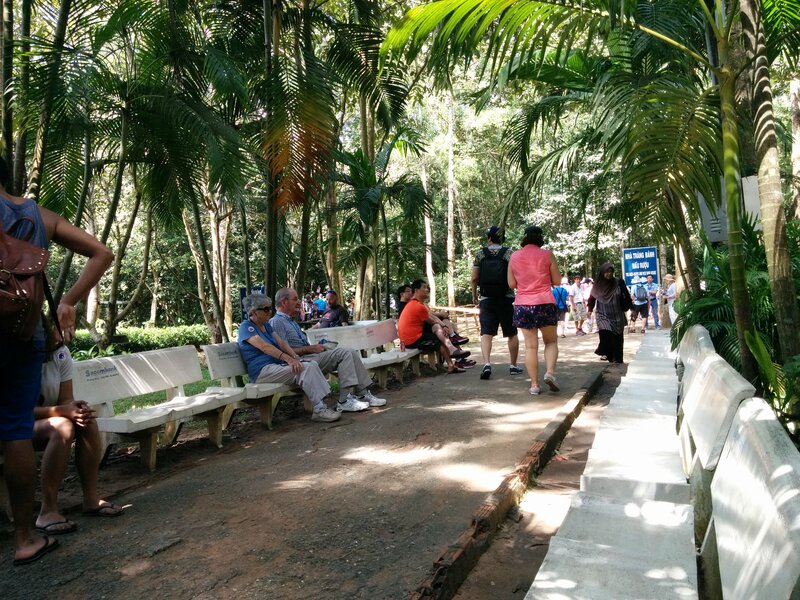 We arrived at the Cu Chi site and began our tour through the jungle. Don’t think it was quite the same as during the war…..they now have paved paths, clean washrooms and a Refreshment and Souvenir area. The brave, who could handle enclosed spaces in darkness and hot stale air, went down into the first 2 levels of the tunnels. The taller people had to crawl on the their knees..and these tunnels had been enlarged to accommodate westerners. Can you imagine what it would have been like to spend years in here along with the rats, ants, poisonous centipedes, scorpions and spiders ? The tour pointed out the use of camouflage to hide the tunnel entrances. The passages were usually about 5 feet in diameter, but in some places they were much narrower. Everyone was involved in building these tunnels…the young were the diggers, even children were involved in collecting leaves to cover the trap doors. We saw various examples of Booby Traps that were used to maim or kill the enemy. They were quite gruesome when you imagined someone impaled on such a device. We returned to Saigon later that afternoon. I decided to see what else I could find on the internet related to the War here in Saigon. I came across the following article which gave me something to think about following my visit to Cu Chi. Sholto Byrnes is a Senior Fellow at the Institute of Strategic Studies in Malaysia. Some of the most iconic images of the last half century, reproduced endlessly in films, were taken in Saigon 40 years ago at the end of this month. Who is not familiar with the photographs of helicopters taking off from what was then the capital of South Vietnam in April 1975, as American personnel and thousands of desperate Vietnamese attempted to evacuate while the armies of the north broke into the city? It marked the end of the Vietnam War, a conflict that cost the lives of at least one million Vietnamese, with one estimate putting the figure at over three million. Given the enormous loss of life, the well-documented atrocities by US forces and the long-term devastation caused by the massive use of Agent Orange to deprive the Viet Cong of forest cover, it is quite remarkable just how friendly relations are now between the US and Vietnam. Diplomatic relations were established in 1995, and a “comprehensive partnership” was launched in 2013. It is a measure of how close the two countries have become that Vietnamese diplomats would rather the old enemy was a more forceful presence in the region. They are hoping Washington will check China’s seemingly inexorable advance across the South China Sea, much of which it claims as its own territorial waters. Much as the amity is to be welcomed, the 40th anniversary of the war should also remind us of how misguided much of America’s pushback against Communism was, over many decades – and to what catastrophes it led. Vietnam was one example. For the leaders of the north, the war with the Americans was a continuation of the anti-colonial struggle against their former masters, the French. Indeed, it was General Giap, the victor of the battle of Dien Bien Phu (which led to France surrendering and withdrawing), who was in command of North Vietnam’s armies against the Americans. The latter, however, couldn’t see beyond “the red threat” and preferred to support a series of corrupt and chaotic military dictatorships in South Vietnam. It is not as though they were unaware of the popularity of Ho Chi Minh, the North Vietnamese leader, throughout the whole country. As Dwight D Eisenhower, the US president, wrote in his memoirs: “I have never talked or corresponded with a person knowledgeable in Indo-Chinese affairs who did not agree that had elections been held as of the time of the fighting [in 1954], possibly 80 per cent of the population would have voted for the Communist Ho Chi Minh as their leader.” And that, apparently, could not be allowed. It was a similar calculation that led the US to support the 1973 coup against Chile’s president, Salvador Allende. That was followed by 17 years of rule by a military junta headed by the late General Augusto Pinochet. Allende had been democratically elected, but America preferred a dictatorship that became a byword for repression – all because Allende was a Marxist. The list of dictators the US supported in Latin America alone is too long to list here, but the policy of favouring anyone on the right over politicians deemed too friendly to Communist powers was applied around the world, and often with disastrous results. It is quite possible, if not likely, for instance, that if General Lon Nol had not overthrown Cambodian ruler Prince Norodom Sihanouk in 1970 – a coup in which CIA involvement was alleged – Cambodia might well have been spared the horrors of the Khmer Rouge. For it was this act that precipitated a civil war in which the US backed Lon Nol, but who eventually fled after Communist troops, initially aligned with Sihanouk, surrounded the capital in 1975. Sihanouk had tried to steer a course between “American imperialism and Asian Communism”. It was America’s man, Lon Nol, “Who obliged me to choose”, he said. Sihanouk’s middle way could have saved Cambodia from a genocide in which one-fifth of the population perished. But it wasn’t sufficiently anti-Communist for his replacement’s backers. The Cold War is long over, of course. But this aspect of it is one that should be remembered as the 40th anniversary of the Vietnam War’s end is marked. What a wasteful, pointless conflict that was, and so at odds with America’s continued commitment to spreading freedom and democracy around the world. For either freedom or democracy to mean anything, a people’s ability to choose a government of whatever political stripe they want is a basic requirement, even when that government is not to the taste of America. But for too long it appeared that American rhetoric was undermined by its actions: stolen elections were ignored, and when they were free, it was more a case of “you can vote for whoever you like – so long as we approve”. Such impressions have not been forgotten in many of the countries affected, and still fill the wells of suspicion about America’s eagerness for forceful interventionism abroad. Rarely can there be a clearer example of muddled US thinking over democracy than the 2006 Palestinian elections. Hamas won that contest by a considerable margin, only to be told by the Bush administration that it would not deal with the group. Hamas was subsequently declared a terrorist organisation by the US. It is a lesson worth bearing in mind when images of the fall of Saigon resurface, whether in print, on television news or in the numerous Vietnam films. Ask yourself: why did those millions die? If it wasn’t for democracy, then for what? ← The Benford’s of Leicestershire and Beyond….